Recovery from a major injury can be expensive, painful, and slow. You may be unable to work temporarily or even permanently, right at a time when medical bills are piling up. In addition to your medical problems, your mental health, career, and family life could all suffer. You need New York City personal injury lawyers you can depend on to get maximum compensation for your pain and suffering. If your injury was caused by someone else’s neglect or malice, it is simply not right for you to suffer all of these burdens alone. That is why the state of New York allows people to win compensation from those responsible for their injuries. Contact New York City personal injury lawyers The Orlow Firm — they are knowledgeable, dedicated attorneys ready to take on your personal injury case. Anything from New York Nursing Home Abuse, to New York City Bus Accidents. If you or a loved one has been hurt by an act of negligence or a civil rights violation, call our offices to schedule a free initial consultation. This is a great opportunity for you to discuss your case with a qualified New York City personal injury attorney. We will answer any questions you have, review your case, and advise you on your best legal options. All of us have a legal and moral responsibility to take basic precautions with other people’s safety. When people behave in reckless or negligent ways, others can be seriously hurt. Unfortunately, there is no shortage of people unwilling to consider other people’s safety. Avoidable accidents injure and kill innocent people every day. If you or a loved one has been hurt by someone else’s thoughtlessness, you are probably eager to see justice done. At the offices of New York City personal injury lawyers The Orlow Firm, we understand this feeling well. We are committed to helping victims of crime, violence, and injustice win the compensation they deserve. We are a father and sons law practice committed to fighting for our clients’ rights. We can reach a fair settlement for you out of court, or aggressively represent you in court. With over 27 years of experience, we know what kind of evidence to collect and what kind of tactics to use. We firmly believe that a person who has been injured or assaulted has experienced enough stress and pain. Let us take on the legal fight while you focus on recovery. We take all cases on a contingency fee basis, so if we don’t win your case, you will not owe our attorneys anything. 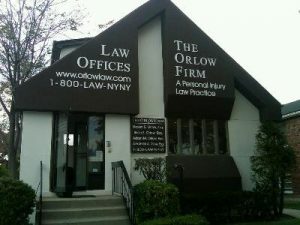 The Orlow Firm, was established in 1981 and has proudly been serving clients throughout New York City ever since. We understand that each case is unique, and devote our energy to building effective legal plans for each client individually. If you have been injured by a negligent party, we can help you. Of course, if you are thinking about contacting one of our New York City personal injury attorneys, you will want to know about us as individuals. That is why we have provided the following information about our family and our firm. To learn more about winning compensation for a serious injury, contact New York City personal injury lawyers The Orlow Firm.